Editor’s Note: A recent research report sheds light on common challenges learning leaders face. These challenges were discovered through research and surveys conducted over the course of a decade. In this series of articles, we will explore these challenges and how learning leaders are responding. This article is the second of an eight-part series. 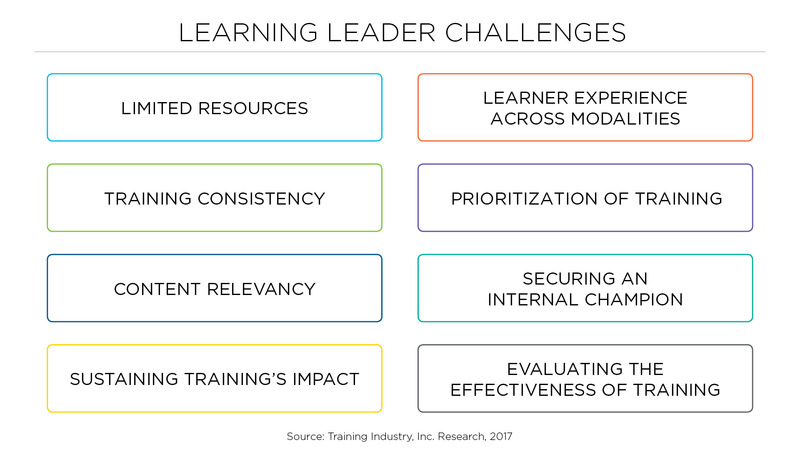 Training Industry, Inc. research has found that many learning and development (L&D) professionals must achieve their goals with limited access to resources. In a business sense, the term “limited resources” can refer to a broad spectrum of resources, including time, staff and budget. “Training organizations have had to evolve in a climate of downsizings, reduced budgets and time constraints,” says Paul Meskanick, MBA, the director of client services for Ingenuiti. These resources, and this challenge in general, affect everyone in an organization in one way or another, but L&D professionals are finding ways to strategically plan around these limitations to do more with less. The results of the research study showed time as the most prominent limited resource. “It is the most salient in terms of time for L&D staff to engage in more training and improve existing processes,” says Tom Whelan, Ph.D., director of corporate research at Training Industry, Inc. It’s also applicable to learners in terms of the time away from the job to train and how long it may take to become proficient. Time constraints and available staff and budget often coincide with one another. For example, if there aren’t enough in-house staff with the time or expertise to author the training and implement it, then it may be necessary to outsource that training. On the other hand, if there isn’t enough in the budget to outsource the training, then it’s likely that the staff will be tasked with making the time to oversee the training design and implementation. Time constraints and available staff and budget often coincide with one another. It’s common to lean on a more abundant resource to fill in the pieces for the more limited one. This may result in overexerting available resources, including personnel. If this happens, remember that while L&D professionals are known for wearing multiple hats, there are only so many hats that can, and should, fit on one head. From the start of designing a training initiative, strive to achieve your goals by strategically planning around the available resources, and make strategic alignment the foundation of your plan. When planning, Meskanick suggests asking two questions about the organization’s business and training goals: “Are they in alignment with strategic priorities? How might they be adjusted based on resource limitations?” The answers can help in establishing a strategic direction. From the start, plan around the available resources, and make strategic alignment the foundation of your plan. While this challenge can put restraints on what an organization and its personnel can do, don’t let it discourage or stop you from creating a plan of action. “Instead of looking at what can’t be done, look at what can be done,” says Meskanick. For starters, he says to keep an open line of communication with senior leaders and/or clients to establish what their goals and objectives are, determine how to strategically align, support and achieve said goals, and identify the resources needed to do so. This open line of communication also makes it easier when deciding what additional resources, if available, are necessary. Communicating with senior leaders can help in both creating and executing a successful plan, because while learning leaders know how important training is, it’s often seen as a cost by stakeholders. “A problem with the training industry [is] we don’t show the strategic value with metrics,” says Dr. Bill Brantley, CPTM, HR specialist at the U.S. Patent and Trademark Office. “The challenge is how to show we have an impact on the bottom line [and] to tell that story in terms that [stakeholders] understand.” An open line of communication with stakeholders will help in ensuring that story is told. Often, if you’re able to show senior leaders the effectiveness of training through evaluation and a return on investment, then you’re able to make a business case for the resources needed to enhance training. “[This] can help in not cutting your budget or taking away the resources that are already limited,” says Brantley. Showing training’s impact can help make a difference when stakeholders are allocating resources. “When the learning organization demonstrates alignment with strategic priories and presents performance metrics, it is viewed as an investment in the business,” says Meskanick. Evaluating training also shows what kind of an effect, if any, the training is having. If it’s not having the effect you were hoping for, but your resources are limited, then something needs to change. Sometimes, it’s a simpler fix, such as curating free resources from the internet to further your knowledge and expertise, or changing the format and delivery of training for a more user-friendly approach. Other times, it can only be accomplished by pulling resources from another area. “To invest resources in one thing, you often have to do it at the expense of another,” Whelan says. He suggests keeping an audit of what is and isn’t being used for training to monitor and adjust resources as needed. “It’s not about throwing money at the problem; it’s about throwing money at the right places.” And if you don’t have money to throw, pay attention to what other resources aren’t being used to see how they can help. “One of the ways to be successful is to be conscientious of not wasting resources,” says Whelan. Similarly, Meskanick says, “Concentrate resources and efforts on activities that generate the greatest return for the business and the learning organization.” Strive to create a plan that works toward optimizing strategic alignment and making sure all employees are familiar with the organization’s goals and objectives. This process also requires “getting out in front of priorities, brainstorming options with key internal stakeholders, developing workable solutions, then assigning talent to manage and execute the work,” says Meskanick. Stay open to ways you can improve the situation. “This may involve reworking prospective deliverables, coming up with creative learning options and adjusting timelines,” says Meskanick. First and foremost, if something needs to change, strategically align the organization’s goals to available resources to ensure success, and then create a plan accordingly. Be conscientious of what resources are being used and when and how they’re being used. Don’t skip the step of evaluating training; use evaluations to see what needs to change, and then convey that to stakeholders to receive more resources. Following these steps will help you do more with less when your time, staff and/or budget are limited. Use evaluations to see what needs to change, and then convey that to stakeholders to receive more resources.